Last week I had some shopping errands to run. While on my way back I happened to drive past my college(the place where I did my under graduation). I have some lovely memories of those days. It was so many years since I passed out of college and I hadn’t had a chance to visit it.I decided to pull over and see the college from inside.It was 3 in the afternoon and the classes had just ended for the day and it was an appropriate time to do so. I wondered if it was still the same old beautiful campus or there were any major structural changes.Filled with excitement and nostalgia I entered the gates of my alma mater. The campus was still as beautiful,the buildings well maintained and the lawns as well manicured as before.Wow! Nothing had changed. I visited the classrooms where I studied, the cafeteria, library,lecture halls and walked through the long corridors lost in thoughts ,reminiscing about my friends and teachers,almost hearing the lively chatter and remembering the happy and fun times we spent there. The college was the same. It was the generation that had changed. 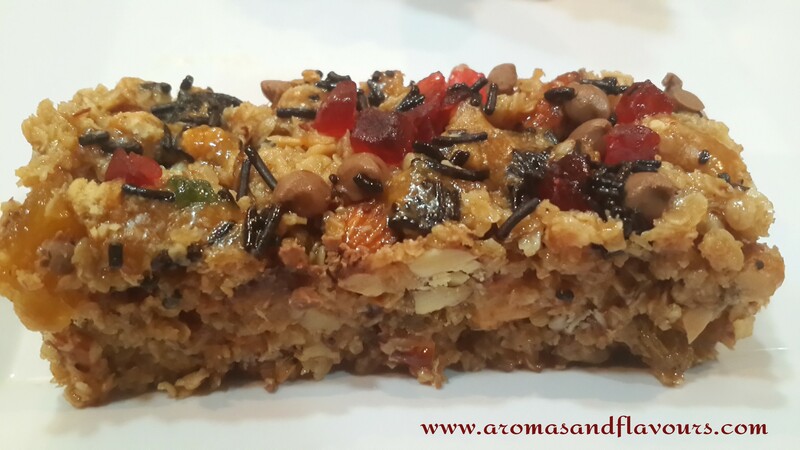 With newer thoughts and refreshed memories I returned home and made these delicious chewy,nutritious granola bars. 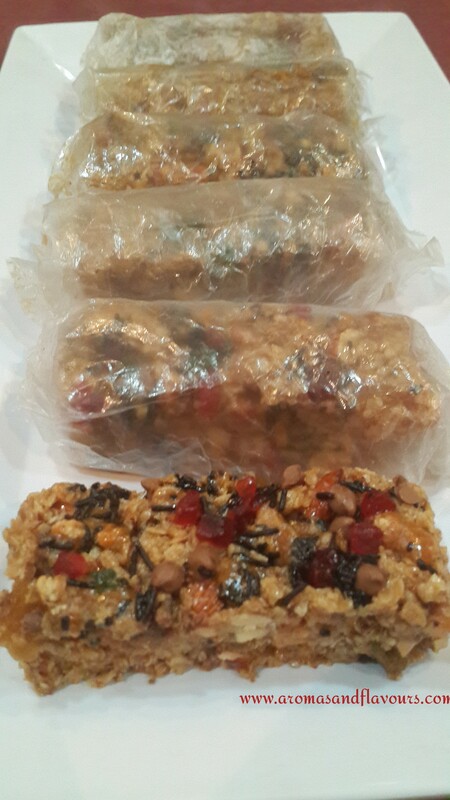 Packed with fruits,nuts,dates,oats,coconut,choco chips,orange and lemon peels and honey these mini snack bars are full of energy and can be an ideal kick start for the day especially for those teenagers or people rushing to colleges or work places and have no time for a sit down breakfast. You can make them in advance on a weekend perhaps,pack them in individual butter papers/chocolate wrappers,keep them in the fridge and just pick one or two of them when you are leaving home. It has to be out of the fridge at least ten minutes before you eat or better still you can warm it up in the microwave for 10 seconds. They look pretty and taste delicious and chewy. 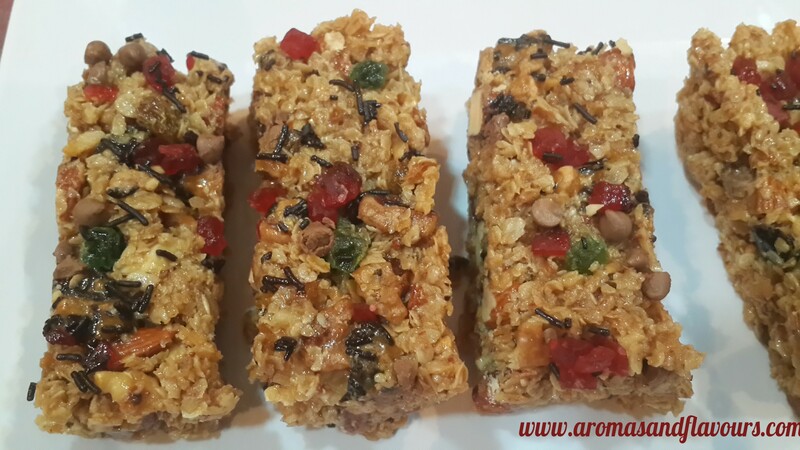 Why not make these yummy snack bars today and be rest assured that your family has the energy to kickstart the day. Line a baking sheet with aluminium foil or parchment paper. 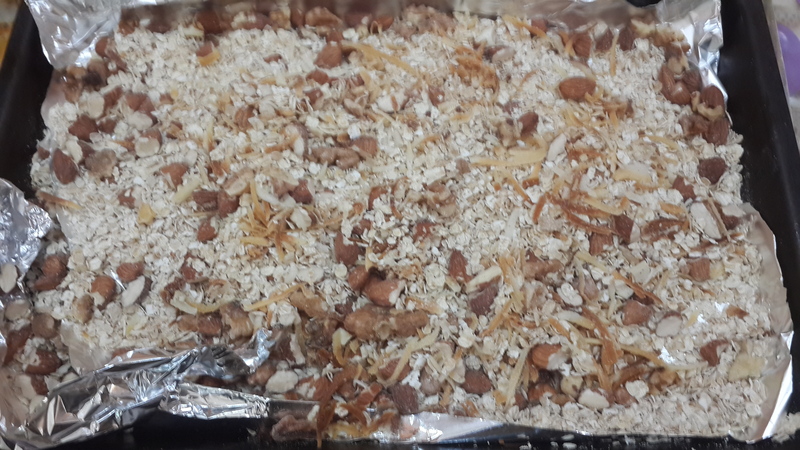 Put in 2 and 1/4 cups rolled oats, 1 cup chopped nuts (almonds,walnuts,pecans) and roast at 350º F for 6 minutes. Add 1/4 cup dry grated coconut and roast further 6 minutes. Take out of the oven and let cool. Toss in 1 cup of dried fruits. 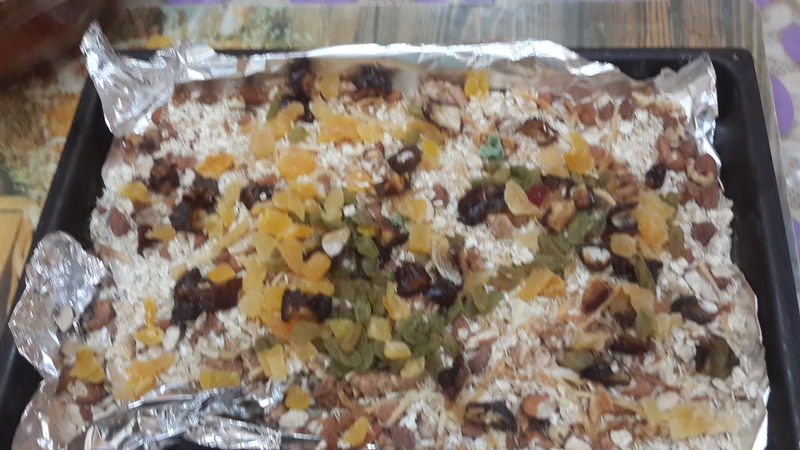 I used mango bits,pineapple bits,raisins and chopped mejdool dates.Mix well. 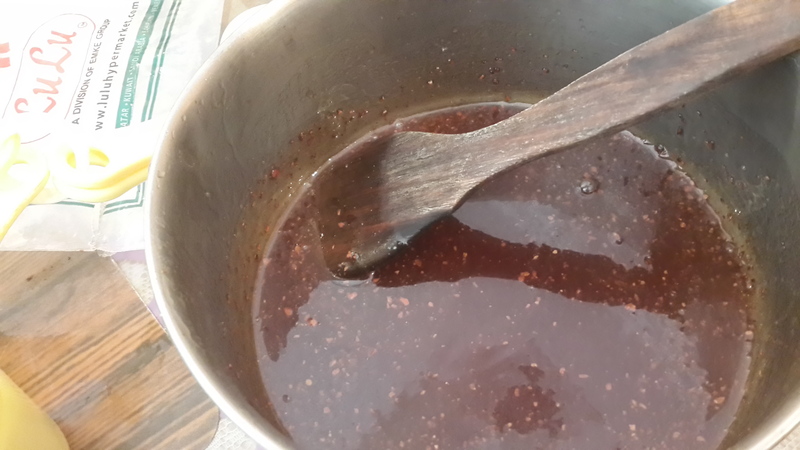 In a saucepan put 1/2 cup+ 1tbsp honey, 3 tbsp. brown sugar,2 tbsp. butter,1 tsp. vanilla/pineapple essence,2 tsp. cinnamon and 1 tsp. salt. Bring to a boil while continuously stirring. Take off heat. Add the roasted oats,fruits and nuts to this sauce and mix well. Line a 8×8 baking dish with parchment paper and grease it. Spoon in the oats and honey mixture into it and press lightly with the back of a spoon.Sprinkle some choco chips and some dried orange and lemon peels. Do not press it hard.It can make the granola bar tough and dense.Bake in a pre heated oven at 325º F for 20 minutes.Let cool. Slice into bars. This should make approximately 10 bars of this size. Wrap the individual bars in buter paper or chocolate wrappers and store in fridge or gift to someone you care about. I am taking this delicious snack to party with my Fiesta Friday friends. Wow! Can’t believe it is the 90th Friday already and it just seems like yesterday. We have some new party co-hosts Effie @ Food Daydreaming and Lindy @ Lindy Mechefske to help out dear Angie. So let’s not waste time and rush to the party..
Do you use the “quick” oats or the ones that take longer, like 20 minutes or so? I think I may love this recipe. It sounds simple and I can buy the fruit and nuts at a reasonable price from Aldi. Yum. As a daily granola bar eater, I have been looking for versions that are not only tasty but healthy as well. Going to be making these this week! I appreciate the tip. Tuesday is a free day on our blog and I enjoy sharing other bloggers stories. I have to make these, just saved the recipe. They look insanely delicious. Thank you Suzanne 🙂 The last one got over today and I am all ready to bake a fresh batch. Yes Vidya. I relived all those fun moments spent with my friends. I really enjoyed the visit. 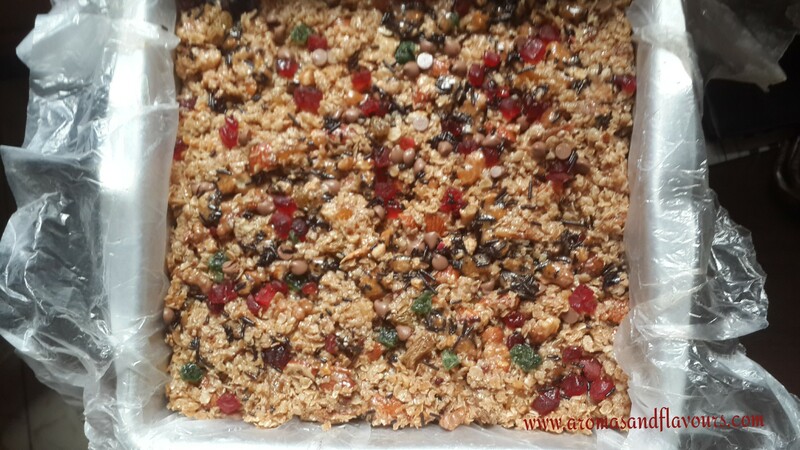 The granola bars turn out very delicious and stay in the fridge for more than a week. Yum, great for a busy school day! Thank you Anshu for liking the recipe. Thank you so much Shehanne. I really enjoyed making them. Easy to make and yummy to taste 👍☺Love sharing my experiments with all of you. Thank you so much for the motivation. Wow – you sure have a lot of goodies in these bars! Are the “green” things in your mix some kind of dried fruit? Thank you dear Judi. They are candied lemon peel bits. Yes there are lot of goodies in those bars. Makes for a filling hearty healthy breakfast substitute. What a sweet story! and yes love these bars! I’ve been making some simple ones myself with shaved coconut, cranberries, and a hint of coffee, but I like the idea of packing it with dried fruit! Thank you Loretta ☺ Once we start making these customised beauties at home we will never go back to the store bought ones. And yes I really enjoyed my trip to the college. However none of my teachers are teaching there. They have all moved on. So couldn’t meet any of them. Oh these look great, I am going to have to make them. Ana, these bars look absolutely scrumptious. I cannot wait to make them. Loved reading about your experience of going back to your college! Love your story …so true! These granola bars would be perfect for my son, who is always on the go with school and soccer! Thanks so much for sharing!! Thank you so much dear Arl ☺ I am sure your son wouldn’t mind grabbing a couple of them when going out. Even I was planning to pack them for my son when he comes for a break from his University to take back. Because his hectic schedule makes him miss his break fasts most of the time. Same here for my son! 🙂 Great idea! I love the color in theses snack bars. And, their chewy nature is right up my alley. Thanks for sharing this chewy treat. I hope you have a wonderful weekend! I also just visited my Alma mater. So interesting to go back. I had to laugh at your comments about selfies. So true. 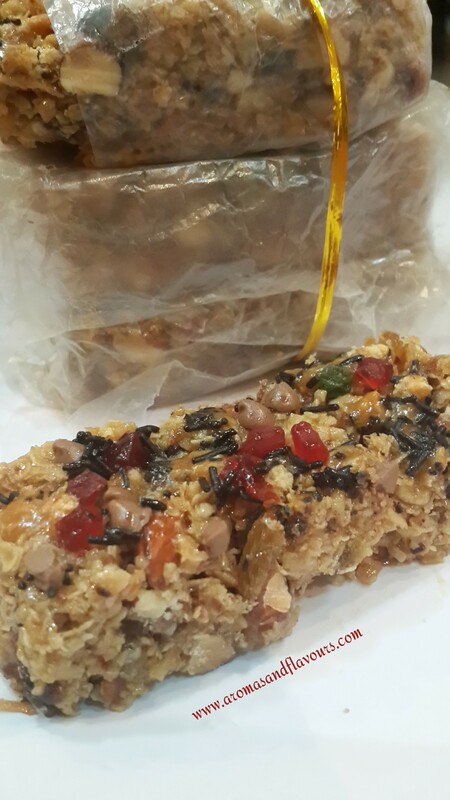 As for the granola bars – I love the combination of the toasted nuts and oats and then all the fruits. Just beautiful. Thanks for bringing these to Fiesta Friday! Thank you so much for the motivating words. Visiting our alma mater after a long time gives mixed feelings right? Can’t explain in words. There is happiness and excitement on one side then there is also a sense of having lost on time, a feeling of growing older when you see the younger generation but still the feeling of happiness supercedes all the other emotions . That sounds like a nice trip back in time. 🙂 it’s not something we really do here, I don’t think. So it sounds interesting! Lovely recipe as well! These look really good – I’d comment more but I have to go take a selfie, haha! Thank you so much ☺ They were indeed very yummy. Convenient nutritious food to grab and rush.